Vintage Nina Ricci L’Air du Temps – This beautiful classic Floral Perfume is still considered to be one of the greatest fragrance creations of all time. 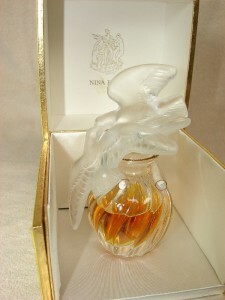 It was launched after the close of World War II in 1948 and the Doves in Lalique crystal symbolize Peace. Bergamot and rosewood are at the heart of this composition, with the main carnation central accord, refined with the notes of rose and jasmine. Other notes are Violet and iris which make for the powdery scent, and the composition finishes with the woodsy notes of cedar, sandalwood and sensual musk and amber complete this ultra feminine composition. 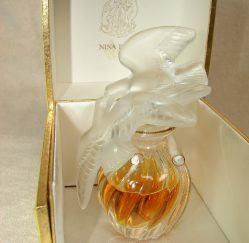 This Bottle is 4″ High, it is an older Bottle, by Lalique and is signed in the old way, in Block Lettering, on the Base of the Bottle. It is still Sealed and the Crystal is Perfect in Every way. The Juice may have evaporated a bit… Not a problem… This is the alchohol that has evaporated, leaving behind the precious oils and flower essences, making the remaining juice that much stronger and fuller bodied. So, it will last just as long.. you use a lot less for the same effect!